It’s strange how certain films trigger something in your own memory and the RBC offering on Friday night did just that. The United Kingdom/New Zealand joint production Tracker (2010) reminded me of the adventure stories that were published in the now long defunct Boys Own Paper a monthly magazine I read in the late 1950’s, it was a publication that shamelessly targeted boys in the days before the term ‘teenager’ was made fashionable! 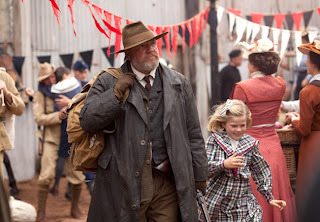 Set in New Zealand shortly after the end of the Second Boer war, which was fought from 1899 until 1902 between the British Empire and the two independent Boer republics in South Africa. Arjan van Dieman, an Afrikaans veteran, arrives to start a new life after he was forced to abandon his home after his farm was burnt to the ground and his lands ruined. 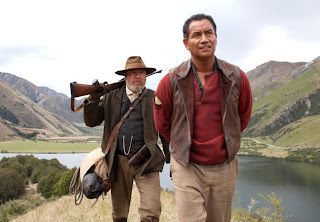 With nothing but what he stands up in he is forced to except employment from the British army when they offer him a generous bounty to track a Maori sailor accused of killing a British soldier in a fight that he did not start. During the many escapes and recaptures a sense of respect grows between the Boer tracker and Kerema the Maori who both realise they have a lot more in common than they originally thought: the mutual hatred of the British colonialists. The superb pairing of Ray Winstone as Dieman and New Zealand actor Temuera Morrison as Kerema, who came to prominence as Jake “the Muss” Heke in the 1994 movie Once Were Warriors, are a pleasure to watch with Winstone achieving a very convincing Afrikaans accent. Shot around the beautiful Queenstown Lakes area in the southwest of New Zealand’s South Island and directed by Ian Sharp with a script from the late Nicholas van Pallandt. This is a very enjoyable piece of filmmaking, a good old-fashioned escapist distraction from a rather wet Friday evening.